Kuala Lumpur, December 23-24, 2008, International Shari`ah Scholars Dialogue (ISSD) is an event that gathers prominent Shari`ah scholars from around the globe. ISSD was previously organized by Bank Negara Malaysia in 2005 and 2006 and this year ISRA took the privilege of organizing the third ISSD on the 23-24th December at Hilton, KL. The objective of the dialogue is to enhance the existing collaboration efforts on Shari`ah matters and strengthen the framework for cooperation and harmonisation amongst Shari`ah scholars. Amongst prominent Shari`ah scholars that attended this year’s ISSD include Professor Dr. Mohamed Ali Elgari, Dr. Mohd Daud Bakar and Dr. Aznan Hassan. The event was a closed door event attended by 70 invited delegates representing Islamic finance institutions, academicians and others. This year around ISSD was a one and a half day event starting with a luncheon talk. The keynote address of this luncheon was delivered by the deputy governor of Bank Negara Malaysia, Dato’ Mohd Razif Abd Kadir. There was one paper presented on the first day, while two papers were presented on the second day. The presentation and the discussions were conducted in Arabic. The first paper discussed about the adaptation of the concept of insurable interest in Takaful. The paper was presented by Zaharuddin Muhammad, an associate researcher at ISRA and was reviewed by Prof. Dr. Mohamad Ali Elgari, a renowned international Shari`ah scholar and Associate Prof. Dr. Younes Soualhi from the Kulliyah of Islamic Revealed Knowledge, International Islamic University Malaysia (IIUM). Zaharudin began the discussion with a historical background on the origin of the concept of insurable interest and highlighted the reasons for its introduction. He then elucidated some common misconceptions between the insurable interest concept and other Takaful/insurance-related concepts, like insurable risk. Following that, Zaharudin discussed the applications of insurable interest in contemporary Takaful practices and highlighted its Shuratic (unanimously consented) dimensions to ensure it fulfils the Shari`ah requirement. He finally wrapped up his presentation with recommendations of steps that needs to be undertaken, including the amendment of relevant laws, to ensure that the concept is legally enforceable and Shari`ah compliant. The first paper that kicked off the discussion on the second day was presented by Associate Professor Dr. Shamsiah Mohamad from the Academy of Islamic Studies, University Malaya. 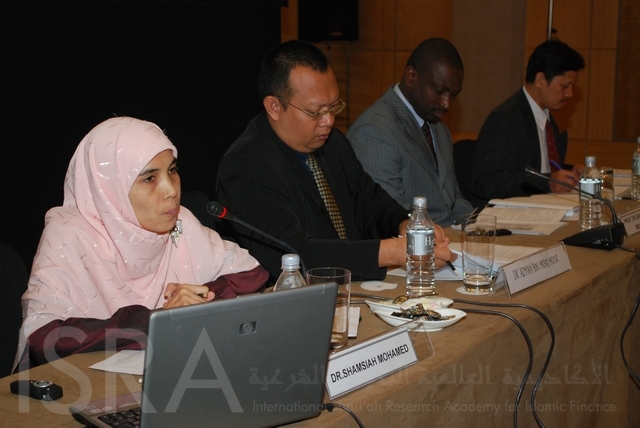 She analysed Shari`ah issues in the secondary trading of Sukuk. Professor Dato’ Dr. Sano Koutoub Moustapha, the Deputy Rector of IIUM and Ustaz Suhaimi Mohd Yusof from BNM were the discussants for this session. Dr. Shamsiah delineated on the general guidelines for Sukuk trading in the secondary market and tracked various Shari`ah opinions with regards to Sukuk trading. She then focused her discussion on three areas in Sukuk trading; the trading of debt-based Sukuk, the trading of Sukuk in which the underlying assets comprise tangible assets, usufruct, cash and debts, and the sale of Sukuk at a discount. Dr. Shamsiah concluded by proposing several solutions to address the trading of debt based Sukuk (Sukuk al-dayn). The last paper was presented by Assistant Professor Dr. Said Bouheraoua from the Ahmad Ibrahim Kulliyah of Law, IIUM. He discussed the parameters (Dhawabit) for the application of the principles of maslahah and darurah. Dr. Daud Bakar and Dr. Abdul Sattar Abu Ghuddah commented on the paper. Although Dr. Abdul Sattar was unable to attend the event, he sent his comments earlier and it was delivered during the session by Dr. Mohd Fuad Sawari of IIUM. Dr. Said began his discussion with the definition of maslahah, dharurah and dhawabit, their related concepts and a summary of usuli (classical scholars) views on its authority and legality. He then discussed the parameters and their respective prerequisites. Dr. Said proposed three prerequisites; first, identification of the characteristics of maslahah and dharurah; second, identification of the core qualifications of bodies or individuals proposing the parameters; third, identification of the maqasid of Islamic finance to ensure adherence to the parameters of maqasid. On the basis of these prerequisites, he proposed a number of parameters and wrapped up the discussion with recommendations for a balanced and comprehensive examination of this pressing issue. This paper aims to explain the concept of insurable interest and its application and relevance to the Takaful industry. The paper begins with a historical background on the origin of this concept and the reasons for its introduction. Next, this paper elucidates on the common misconceptions about insurable interest and the differences between this concept and other Takaful/insurance-related concepts. Following that, the applications of insurable interest in contemporary Takaful practices are explained, together with its Shuratic dimensions that aim to ensure that all Shari`ah tenets are complied with. The paper concludes by proposing several steps to be undertaken with regard to insurable interest, including the amendment of relevant laws. This paper discusses about sukuk trading in the secondary market, with delineations on the general guidelines for sukuk trading in the secondary market, and various Shari`ah opinions with regards to sukuk trading. The focus of this paper is on the Shari`ah issues pertaining to secondary sukuk trading, such as the trading of debt-based sukuk, the trading of sukuk in which the underlying assets comprise tangible assets, usufruct, cash and debts, and the sale of sukuk at a discount. The paper concludes by proposing several solutions to address the aforementioned issues. Speaker – Assoc. Prof. Dr. Shamsiah Mohamad, Academy of Islamic Studies, University of Malaya. Discussant – Prof. Dato’ Dr. Sano Koutoub Moustapha, Deputy Rector of the International Islamic University Malaysia (IIUM), Ustaz Suhaimi Mohd. Yusoff, Bank Negara Malaysia. This research is an attempt to suggest the parameters of and limits to the application of maslahah and dharurah in Islamic finance. It begins with the definition of maslahah, dharurah and dhawabit, their related concepts and a summary of usuli views on its authority and legality. It then discusses the parameters, and their respective prerequisites. Three prerequisites are proposed; first, identification of the characteristics of maslahah and dharurah; second, identification of the core qualifications of bodies or individuals proposing the parameters; third, identification of the maqasid of Islamic finance to ensure adherence to the parameters of maqasid. On the basis of these prerequisites, the research proposes a number of parameters. The research ends with findings and recommendations for a balanced and comprehensive examination of this pressing issue. Speaker – Asst. Prof. Dr. Said Bouheraoua, Ahmad Ibrahim Kulliyah of Laws, IIUM.